Best Jet Ski For Beginners – It’s Not What You Think! When you’re a beginner in the Jet Ski world it can be very confusing and at times awkward. I saw this all the time when I sold them. I would often get asked – what is the best jet ski for beginners? But those watercraft have got to be the worst for beginners. — Let’s talk about it. 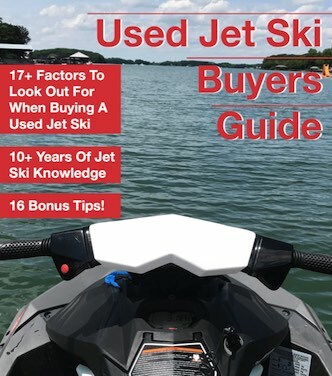 What Should Beginner Jet Ski Owners Get? I see it posted everywhere – You should get a Spark or Ex for your very first watercraft! Coming from someone who has sold many watercraft and done way too many test drives with new people to the Jet Ski I can honestly say a Sea-Doo Spark or Yamaha EX or any Rec-Lite category of watercraft is not where you should start. Anything in the Recreation category is what you want. The Recreation category contains the GTI from Sea-Doo or VX from Yamaha or STX-15F from Kawasaki. Why Is The Recreation Category Ideal? The most prominent reason why I’m saying to go with the recreation category is 2-fold. The first reason is that this category will more than likely have iBR or RIDE or even a reverse. The second reason is that the recreation category is going to be more stable than the Rec-Lite category and more perfect for a family. A recreation category Jet Ski will be more stable which is ideal for pulling tubes and riding more than one person on it at a time. To be honest, when it comes to the smaller Spark and EX a 2-seater is really a 1-seater, and a 3-seater is really a 2-seater. That is if you’re an “average size”. Where a bigger recreation machine like the Sea-Doo GTI or Yamaha VX I would (an over 200-pound man) feel more comfortable having 2 other people on it with me. Let’s not forget all the stuff you’re going to carry like tubes, ropes, and all the Jet Ski Accessories. A Recreation category watercraft have more storage then the Rec-Lite ones. And when you’re new you don’t know what stuff you really need until you need it so you might as well bring all the stuff you can. While I don’t think you should start off with a Spark or EX. If you want to get one and you’re new feel free to get one. Just make sure to get the Spark or EX with iBR or RIDE on them. Being able to dock and control the watercraft is the hardest for beginners to understand. But throw a beginner on a Jet Ski with iBR or RIDE and they get the hang of it quickly. They’ll be docking like a pro in minutes. What is iBR or RIDE? If you never heard of iBR or RIDE before they are Sea-Doo (iBR) and Yamaha’s (RIDE) way of braking, reverse, neutral, and forward on a watercraft. Braking is entirely new, well, Sea-Doo came out with it in 2009 and Yamaha’s RIDE came in 2015 but once you use it, you never want to go back. If brakes are not an option then at least get a machine with a manual reverse as that makes docking so much easier, not as easy as iBR or RIDE but still super helpful. When you don’t have brakes or reverse, and yes they do sell watercraft without them like the base model Spark and base model EX, docking is something that takes longer to learn. Jet Skis are fast; there is no denying that. But many of them come with an option to allow you to learn the watercraft. For example, Sea-Doo has a learning key which can restrict the power of the craft. Yamaha has a fob that can do the same and Kawasaki does have a slow key too. These slow options are perfect for new riders or for the buddy who thinks he knows what he’s doing, but he doesn’t. Why Have A Slow Key? And I know what many of you are thinking. A “slow key,” really?! I want to go fast! And when I tell you that many of the slow keys restrict you to around 35mph I can hear the laughing from here. What many new riders don’t get is that 35mph is fast if you’re new. Sure it feels slow in your car, but the car you have a whole roll cage and AC blowing on you while you’re jamming to music. A Jet Ski doesn’t have a windshield or a roll cage or really anything around you. You don’t even have a helmet, so you hear all the rushing wind in your ears – there is no other feeling like it (besides a motorcycle). I’ve had many new riders never go beyond 35mph as they deem it fast enough, that slow key makes perfect sense if you’re new. Over time you’ll get used to it, and you’ll want to faster. But let’s walk before we run! If you’re new, like super new and never owned a boat or a motorcycle, then avoid the big engines. Anything that is under 200 HP is more than enough for the average person. A 90HP or 130HP engine is still plenty and still fast for the average person too. If you’re new, honestly stay away from 300HP watercraft. Those suckers are no joke. At least have some riding experience on watercraft before you go to 300HP. If you have kids who want a Jet Ski, the best thing you can do is sign them up for the boaters safety course. Many states actually require a boaters safety course for people under a certain age. When I took mine in North Carolina, it was for anyone under 26. Even if you’re not required to take one, I still recommend you take the course no matter how old you are. It seems silly that we require a drivers license for operating a car but in many states as long as you’re over a certain age you can strap yourself to a 300HP rocket of a Jet Ski. If you’re getting a Jet Ski for the kids and they have taken the safety course then a Spark might be good for them. A GTI/VX would be good too, but a Spark would be cheaper. Or even consider a used (good) watercraft as your first one. The great thing about the Sea-Doo Spark or even Yamaha EX is that they have the smallest engines and don’t go the fastest. But this does bring back to my point of having iBR or RIDE. I personally would rather have my kids on a machine with Brakes just in case something happens. If someone pulls out in front of them, they have brakes and can better control the situation. Remember I’m just some guy on the internet. Your needs may be different and a Jet Ski with no reverse might be perfect for you. Or you might hate the looks of all the recreation models but love the looks of the 300HP models. It’s okay to get what you want. Many of the higher end models with all this power will still have the features that can help to keep you in better control with use of the learning key or different modes like touring. But from the years of selling Jet Skis I’ve seen that the Recreation Category is the best for beginners, even a Rec-Lite with iBR or RIDE is still good. The next step at this point is comparing all the models and see which one fits your needs the best. I have a post that covers all 2018 watercraft here. Appreciate all the great knowledge/experience sharing on your site. Really helpful. 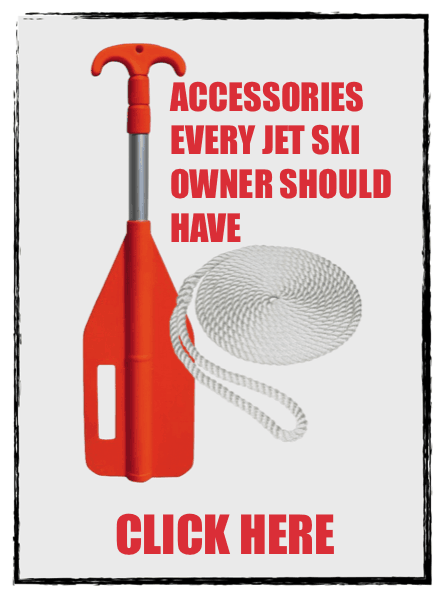 Got a question — looking at buying a couple of skis; we’re new to ownership, but have boated and ski’d frequently. Have 3 kids, 16, 16, 14. Live right by Jordan Lake in NC. Looking at a couple of options from local dealers. — 2017 Yamaha EX Sport ($7200) or 2016 Yamaha VX Cruiser ($6800). Both are inventory closeouts. I’ve read all your reviews (as well as some others). Leaning toward the VX for feature/comfort/price. Thoughts? The VX is a better buy if you ask me. It’s going to be more stable and has more storage then the EX models by a long shot. And it looks like you’re getting an amazing deal on one too. Since it’s an inventory close out 2016 model that would make it 2 years old, I’m very sure that dealership wants to move it! But still, go over the ski to make sure there are no scratches or nothing looks out of place. Even test ride it if you can. Not saying anything will be wrong with it just want to make sure everything is good since you’re going into the colder months and won’t be able to fully see if anything is wrong til spring. You have become our “go-to” guy in researching our jet ski purchase, thank you for sharing all your knowledge. We are debating between a 2016 used wake 155 with 83 hours for $9100 and a new 2018 wake 155 with the polytec hull, 3 year warranty for $11700. Which would you recommend? The 2018 Wake 155 will not have the Polytec hull, only models with the 90HP ACE engine will have the option to go with Ploytec. If you ask me the 2016 model is priced way too high, but then again these WAKE models do hold their value very well. If you’re getting the 2018 WAKE 155 out the door for $11,700 then I would for sure go with that one since that’s a great deal. Either way, you can’t go wrong, the WAKE series are good all-around machines that everyone wants. I have read all of your great advice. My wife and I are going to buy our first jet ski. We motorcycle and kayak together tandem, so we will need a machine for two. I like the sea doo gtx in either the 230 or 300 version. I also like the yamahas svho. I’m leaning towards the 230 because of fuel mileage thinking we could do some long distance cruising i.e. the san juan islands or florida to bahamas on this machine. For the ocean would this be a good choice. Of course as a former sailor we would not go alone, take serious cosideration of the weather, wave height, and carry gps and plb’s. The GTX 230 would be a great machine for you and your wife. We are new to the sport but my son and I rented while in Florida and had s blast, we have children ages 10 and 16 that really want to be able to tube (one or two tubers) and wake board behind and my wife and I would like something roomy and stable. At first we were looking for a small jet boat but hard to find anything new for the around $10,000 range. I would prefer something new so we are not dealing with someone else’s problem we don’t catch and can enjoy time on the water. If you know of anyone that still makes jet boats let me know as it seems like most have went to PWC. Otherwise we are considering the 2018 Yamaha VX Limited or Ski Doo 155 Wake series. Do you have a recommendation between the two series and is the motor size of either series plenty to pull tubes? If you have other suggestions we would love to hear them. In case it matters we are in MN so fresh water lakes, also I am about 200lbs and my wife is about 240lbs if that plays into modelat all. Thanks for the great content and advice. Scarab makes a small jet boat called the 165G, that is going to be the cheapest new option. Both the VX Limited and Wake 155 are great machines that come with a lot of accessories. Both, in my opinion, are a great buy. Both will pull tubes just fine, but the Wake 155 has a slightly more powerful engine so it will handle the get-up-and-go better. I’ve ridden myself (240lbs) with someone who was 200lbs on a GTI body and it handles and rode fine. I wouldn’t add any more people though. One thing of note is that the Wake 155 will have ski mode which is nice if you plan on doing a lot of wakeboarding or tubing – gets the speed and take off just right so the driver doesn’t have to do it. The best thing to do is go sit on each model at the dealership for at least 15 minutes to see how each feels. You can’t go wrong with either machine. Great informative reports. Thank you…. New to the sport but have rode a lot of quads and sportsbikes. Have water experience as I was in the navy as a young adult. Now 40 with two kids aged 10 and 7 and would like to invest in a jet ski. Looking to spend about 10k Canadian (as I live in Ontario, Canada). Looking for a two seater that will ride mostly calm lakes, but may have to endure minor choppy waters at time (lake Ontario). Tube pulling and maybe wakeboard abilities in the engine power. Basically looking for a good family ride that can let daddy open it up just a little when he needs to lol. You could get a really nice Spark for that price and with minor chop, it’ll be a great machine. Stick with the Sparks that have iBR or if you can get a used GTI or VX if you plan on doing a lot of pull sports. Excellent articles and thank you for sharing your expertise with us . We are new to water sports and purchased our our first jet ski a 2017 Yamaha ex deluxe last year . Even though we have rented jet skis many times over the years while on vacation and had no problems riding them our jet ski feels unstable .in choppy waters it feels like it’s going to roll. Would you advise upgrading to a recreational jet ski or do you think this an issue that needs to be looked at by the dealer . We are seriously thinking of upgrading to a recreational jet ski. Which one in you opinion is the most stable? The rental jet ski you rode was more than likely a Yamaha VX model which is more stable than the EX especially if you have more than 1 person on it. If you can upgrade to the Yamaha VX or even the more stable Yamaha FX series you should. The EX and Spark models main appeal is that they’re nimble machines so there is no getting away from them being unstable in the chop. The most stable in the industry would be Sea-Doo GTX or RXT models. My first time riding a jetski was a seadoo rxp 300 rs. (no learning key) And it was great and when you are 1 day on the water with a seadoo with less power you get used to it the same as one with 300 hp.